It’s not unusual for Jakartans to discover more and more pythons as the rainy season progresses, with the latest one found trapped in a fishing net in Thousand Islands regency on Tuesday. The snake was 5 meters long, said Eko Mahendro, chief of the South Thousand Islands Fire and Rescue Team Sector 8 unit. 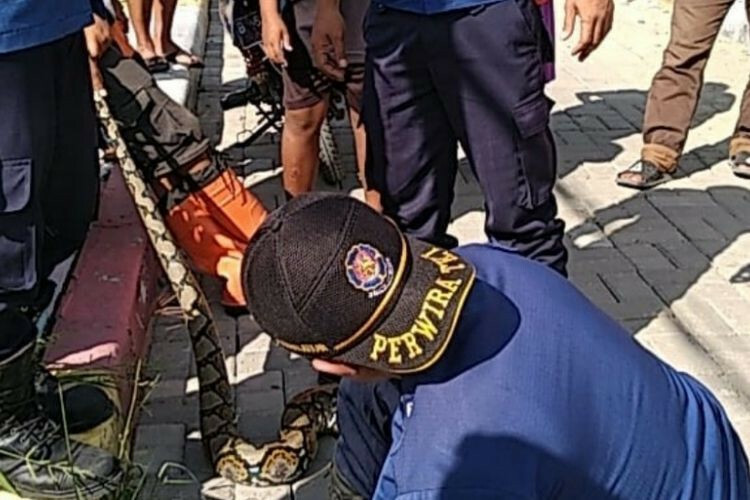 "A Public Facility Maintenance Agency [PPSU] officer found the python trapped in a fishing net in a pond near the Pari Island subdistrict office," Eko said as quoted by kompas.com on Wednesday. Eko said the PPSU officer had been cleaning the pond. After receiving a report of the snake’s discovery, three rescue officers were sent to capture it. "Right now the snake is being held at the [South Thousand Islands] fire station," Eko said.